Jim Thorpe was one of the most outstanding athletes in history. In addition to several seasons as a profession football player, Thorpe played both basketball and baseball professionally, and he also won two gold medals at the Olympics. 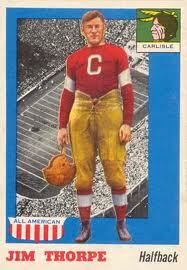 In 1955, two years after his death, Topps included a Jim Thorpe card in their set of past and current football players. The entire set continues to fetch high prices because the cards’ design is aesthetically pleasing. One of a few cards treasured by collectors in the set, the 1955 Topps All American Jim Thorpe is rare, extremely desirable, and thus valuable. Jim Thorpe’s achievements coupled with the popularity and scarcity of the 1955 Topps All American set make his card a generally good buy. In 2012, an example of this card graded at PSA 9 sold at auction for more than $5,700. Cards at this grade, however, are extremely rare, with only ten ever graded by the PSA. Because lower grade examples are more common, they are worth far less. Examples graded at PSA 7 usually sell for around $500, and those graded at PSA 6 are worth even less, often selling for less than $300. There are a wide range of prices and grades of this card, but each is an investment that can be rewarding. Cards at higher grades are far scarcer, but they are far more expensive, introducing much more risk. Lower grades are more common and cheaper, but probably will not accumulate as much value as the higher grades. Both ends of the spectrum, however, can be rewarding. It is almost certain that these desirable, vintage cards will appreciate in value, and, the worst case scenario is that they don’t increase at all because they are very unlikely to lose value. The ability for these cards to increase significantly in value over time is why the 1955 Topps All American Jim Thorpe is a very stable and potentially rewarding long term investment.